The latest monthly report from Realestate.co.nz tracking the supply side of the property market headlines a story that has been consistent for well over 2 years now. Step back to December 2011 and the report headlined "Active property market still favours sellers". The fact is we have been experiencing a property market with what we constantly describe as a shortage of supply for close on 3 years now. At some point you have to ask are we merely living in an aberration of the norm, or is this the norm? The chart below ably demonstrates the supply constraints which the market has experienced as measured by the availability of houses for sale set by the number of weeks it would take 'in theory' to sell all the current stock based on current rate of sale per week. We certainly experienced a period when inventory levels exceeded a full year and topped 60 weeks back in 2008, but for the period of the last two and a half years the level of inventory has settled to around 6 months levels. The fundamental problem we face in analysing the property market is access to data. In regard to sales data we have through the Real Estate Institute sales data by month going back to 1992 which allows us to identify the cycles of the market - the highs of the mid 90's, the lows of the late 90's the bubble of the mid '00's and then the crash and subsequent recovery. However when it comes to supply data we are limited to the past 7 years as the database of Realestate.co.nz only really became reliable from January 2007. It is therefore somewhat risky to assume that the levels of inventory below the 26 week level is exceptionally low and assume that the 7 year average of 37 weeks is the norm. It is quite likely that the norm may actually be 26 weeks and the 50+ weeks levels the aberration. In fact from a cursory reference to some overseas markets 26 weeks seems to be the norm. Supporting this proposition is a further analysis I have undertaken on available data examined the trending of both sales and listings across the country over the past 5 years using a 12 month moving average to eliminate any seasonality and look to see a long term trend. The insight is valuable. This chart highlights in grey the fact that the variance trend in sales is more significant than that in listings - not surprising to some extent as listings volumes have tended to be around twice the number of sales, but what is very interesting is the past 6 months right up to November where there has been effectively no growth in the 12month average number of listings yet sales continue to growth on a moving annualised basis of over 10% - so we continue to see sales rising far faster than listings. With this as an interpretation of the status of the property market it would now seem to be illogical to constantly scream that listings are in short supply - are they really?! I am now more than ever convinced that what we are really seeing here is a maturing of the interpretation of the data around listings and inventory such that in overall terms I judge that the NZ property market is actually pretty well balanced with 26 weeks being the norm and the current level of 24.8 weeks being right on the norm. After all if this was a supply constrained market would we not expect to see either of growing listings or erratic buyer behaviour (although I suspect some would argue the rise in price is just such an erratic behaviour). Clearly taking this approach to a new norm would mean that some regions are actually in buyers' markets whilst other are actually less likely to be in severe sellers' markets. 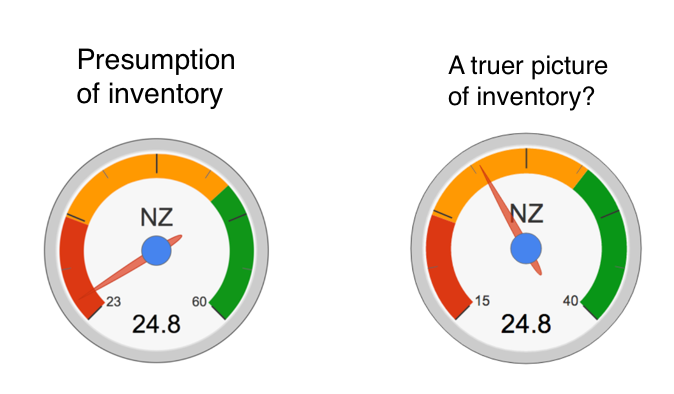 In terms of the Property Dashboard could this actually be a truer reflection of the NZ property market?